Listen in to the second episode of our series examining the world brought to us by — and cultural shift created by — The Black Panther movie. We delve deeper into the film’s complexity in a lively, humorous, and analytical discussion. 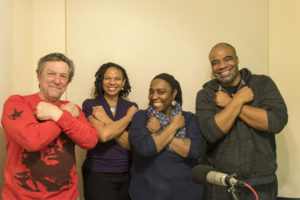 With: Johns Hopkins History Professor Dr. Nathan Connolly; UMBC American Studies Professor Dr. Kimberly Moffitt; and Kalima Young, Lecturer in Electronic Media and Film at Towson University. Enjoy our latest journey to the world that brought us Wakanda.